A greener and cost effective way to transport people is always an important issue. Well this design was entered into the Australian Design Awards competition. 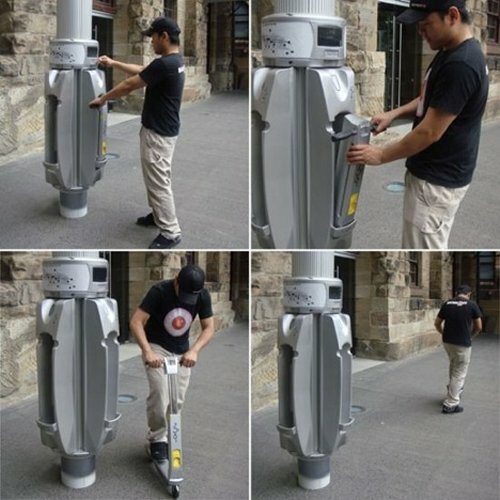 It’d be great for heavily trafficked tourist areas or just spots where a lot of people tend to go on foot. After a while, walking can become tiring when you’ve got a long walk. Plus these scooters will get you there slightly faster than they normally would. The scooters are folded up and placed into the lamp post and then when you want to use them you just take one off of the post. The electric scooters will go 16km/h, which is at least a little faster than on foot. It does raise some questions as to how to prevent theft and vandalism. However, it’s a refreshing new take on public transportation. For safety reasons there will be a supplied helmet that the user must wear when they register to use the system. You would also of course be required to follow any existing cycling and road rules. They should have these scooter rental stations at all city bus and train stations and large outdoor events. I guess its kinda like renting luggage carriers at the airport.